PALU, Indonesia (AP) — Climbing over reeking piles of sodden food and debris, a crowd on Wednesday searched a warehouse wrecked in Indonesia’s earthquake and tsunami for anything they could salvage: cans of condensed milk, soft drinks, rice, candy and painkillers. A trickle of emergency aid is only now reaching parts of Sulawesi island, five days after the destructive quake that killed more than 1,400 people, and some increasingly desperate survivors are taking matters into their own hands. Indonesian authorities have been struggling to get relief to survivors who have been left without food, water, fuel and medicine after Friday’s magnitude 7.5 quake and tsunami that smashed homes and businesses, downed communications and made roads impassable on Sulawesi. 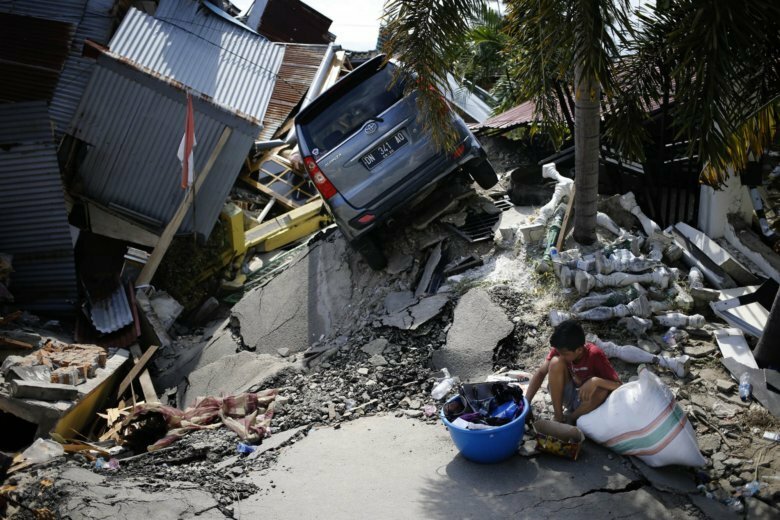 The official death toll rose to 1,407 on Wednesday, with thousands injured and more than 70,000 displaced, said national disaster agency spokesman Sutopo Purwo Nugroho. He said the number of dead would increase, but that rescue crews had reached all affected areas. The horror was still fresh in the minds of those like furniture maker Khairul Hassan, who was working at a shop near the beach in front of a row of warehouses when the ground shook violently. He ran to a hill and watched as the ocean heaved and hurled forward. President Joko “Jokowi” Widodo visited the disaster zone Wednesday for a second time, saying there’s still work to be done, but that conditions were improving. The U.N. estimated that some 200,000 people need assistance, announcing a $15 million allocation to bolster relief efforts. Australia said it will send 50 medical professionals as part of a $3.6 million aid package. The U.N. said the Indonesian Ministry of Social Affairs has asked UNICEF to send social workers to support vulnerable children who are alone or became separated from their families. Some homeless residents weren’t waiting for help. Besides those searching for food, dozens of others combed a flattened complex of warehouses along Palu’s ravaged coast for anything they could sell or use to rebuild homes. They carted away corrugated metal, wood, piping and other items. They included all ages, middle class and poor, university students and sullen young men. Rehanna, the student searching the warehouse for food, had come from Balaroa, a neighborhood of several hundred houses in Palu that was turned upside down by the quake and where many remain buried beneath the rubble. Picking through the pile nearby was a 50-year-old woman named Rosminah, who had a plastic shopping bag bulging with muddy packets of food. He added that a Singaporean military transport plane will help evacuate victims from Palu. In addition, aircraft from South Korea, the United Kingdom and Japan were expected to ferry aid. Separately, a volcano erupted on another part of seismically active Sulawesi island, about 940 kilometers (585 miles) northeast of the disaster zone. It sent up a plume of ash more than 6,000 meters (20,680 feet) high. Planes were warned about the ash cloud billowing from Mount Soputan that can be hazardous for aircraft engines. No evacuations were ordered in the area. Experts said it’s possible the quake accelerated the eruption, but there is no concrete evidence to prove that. Activity at the volcano had been increasing since August and began surging Monday, according to the head of Indonesia’s Volcanology and Geology Disaster Mitigation Agency. The vast archipelago of 260 million people is frequently struck by earthquakes, volcanic eruptions and tsunamis because of its location on the “Ring of Fire,” an arc of volcanoes and fault lines in the Pacific Basin. A powerful quake on the island of Lombok killed 505 people in August. Associated Press writers Niniek Karmini in Palu, Indonesia; Margie Mason and Eileen Ng in Jakarta, Indonesia; Rod McGuirk in Canberra, Australia; and Edith M. Lederer at the United Nations contributed.